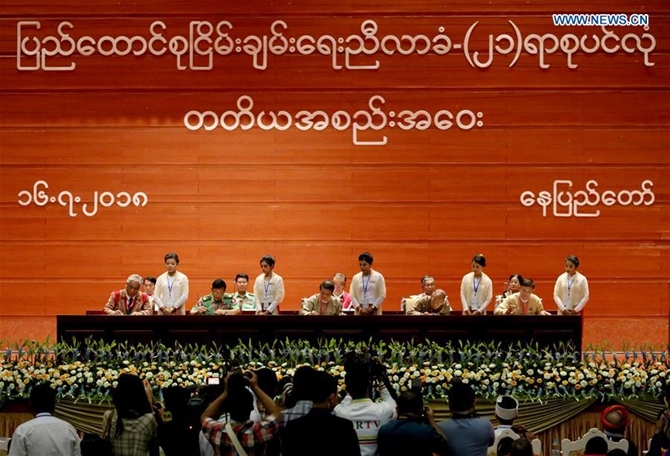 The third session of Myanmar's 21st Century Panglong Peace Conference concluded in Nay Pyi Taw on Monday with 14 more basic principles adopted as the second part of a union accord for peace. The 14 agreed principles in accordance with the Nationwide Ceasefire Accord (NCA) were signed by leaders of participant groups of the government, parliament, military, ceasefired ethnic armed groups and political parties. Of the basic principles, proposed by the Union Peace Dialogue Joint Committee (UPDJC) for establishing a democratic and federal union, four are related to political, one to economic, seven to social and two to land and environmental issues. The four political-related basic principles cover gender equality, including at least 30 percent by women in each sector, prevention of violence against women and raising of women's capacity. The one economic-related basic principle calls for rights for regional or state governments to devise and implement economic development policy and projects of their own as a priority for the interest of their regional people without impacting on other regions or states. The seven social-related basic principles include implementation of all-inclusive education system, universal health coverage, enactment of laws that guarantee women's rights and harm reduction for drug addicts. The two land and environmental-related basic principles deal with the requirements that land in the country belongs to local citizens only and shall not be owned by foreigners directly or indirectly, and pre-assessment shall be made in terms of environmental, social and health impact as well as coordination with local people before implementing projects using land. The second session of the conference held in May 2017 approved an initial of 37 basic principles for establishing federalism under the NCA.